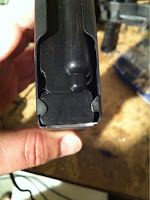 If you are a fellow DPMS 308 owner and have replaced all your magazines with Magpul LR20, you now are wondering what to do with all those factory magazines they don't work right. 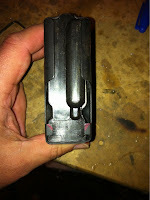 A couple of the issues with the factory metal magazines are that the loaded height varies over 1/8", the front of the magazine is too high and catches the case edges during chambering as well on the rear of the feed lips, and finally the follower retaining clips are square and smack into the case shoulder during chambering. All this equates to poor feeding, lots of jams and FTF, and cases that are beat to hell. 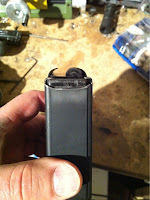 The solution is pretty simple with a little Dremel tool work. First mark a line 1/16" below the the front of the magazine. Mark the follower retention clips. 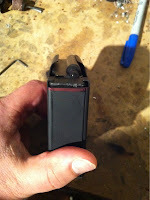 I used a drum sanding bit on my Dremel tool to provide a little more clearance on the front of the magazine and the follower retention clips. After I finished I hit all the ground surfaces with a polishing bit and re-bluing solution. 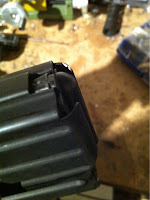 The result are magazines that function nearly as well as my Magpul magazines and don't beat up my brass so much.